I am a 1990 graduate of the Tufts School of Veterinary Medicine in Grafton, MA. After vet school graduation, I landed a "dream job" in Seekonk, MA at a mixed practice. For two years I took care of cats, dogs and horses. I learned a lot in those two years, but I was working 90 hour weeks with in-office appointments, farm calls and emergency coverage. I quickly started to burn out, so I took another job with a clinic in Gardner, MA. The hours were more reasonable, but I was only caring for cats and dogs. I stayed at this clinic for 2 years, and then I decided to take some time away from veterinary medicine. After a 6 month vacation, I started doing relief work at a variety of clinics in Franklin and Hampshire County. After 2 years of relief work, I started the Cat and Dog Housecall Practice. It was November 1996 and I filled my car up with some supplies and did some advertising. I was not sure how it would all turn out but many years later I am still doing house calls and loving it. The new mobile vehicle is a 2013 Mercedes Sprinter and it is my second truck. My first truck, which was a class A Ford E 350 conversion, lasted 16 years but had to be retired. 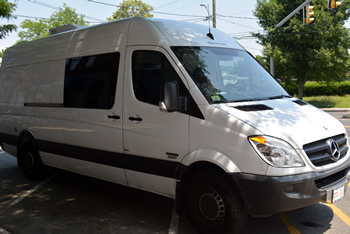 The Sprinter was customized in Texas by Sportsmobile and it arrived early December 2013. 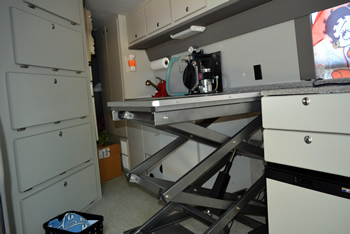 Inside, it has a lot of storage space, one cage, a lift table, an anesthesia machine, surgery and lab equipment, an x ray machine, a dental machine, a sink and refrigerator, an air conditioner and heater. I can do what most clinics do but in a very small portable space. Besides doing routine and sick animal visits, I may do 2-3 surgeries in a week and 4-5 dentistries in a month. My x-ray machine is a small portable unit, and it has its limitations with big dogs, but it still gets a lot of use. I also have the ability to run lab work on my patients if need be. The truck is also stocked with supplies, products and a pharmacy of drugs. I love the new truck. It is very fuel efficient getting 2-3 times more MPG than my old truck. I cannot imagine being a house call vet without it. Copyright © 2019. 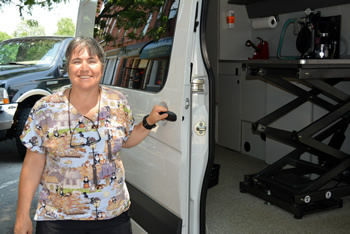 Western Mass Mobile Veterinarian - Dr. Christine Massaro - Housecall Practice. Website by Web-tactics, inc.